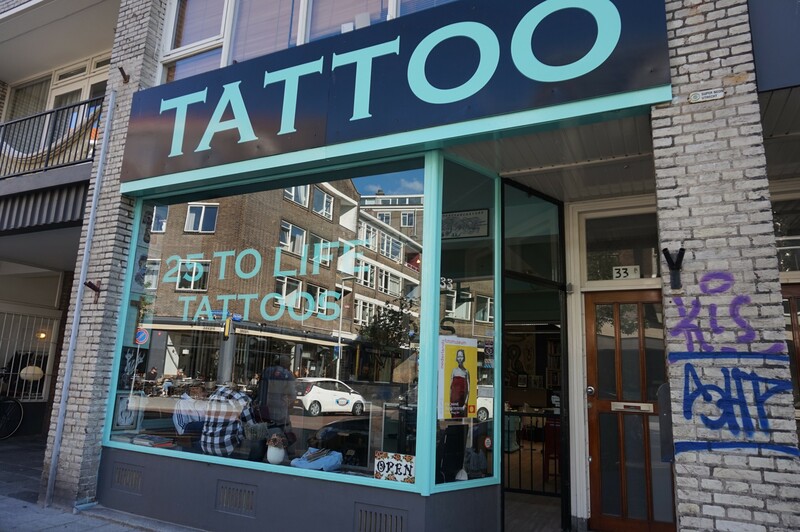 I spent today at one of Holland’s most famous tattoo studios, 25 To Life. Nico and Moira at work. Photo: Rebecca Rimmer. Nico Mensinga’s studio has just celebrated its 12th birthday this week. 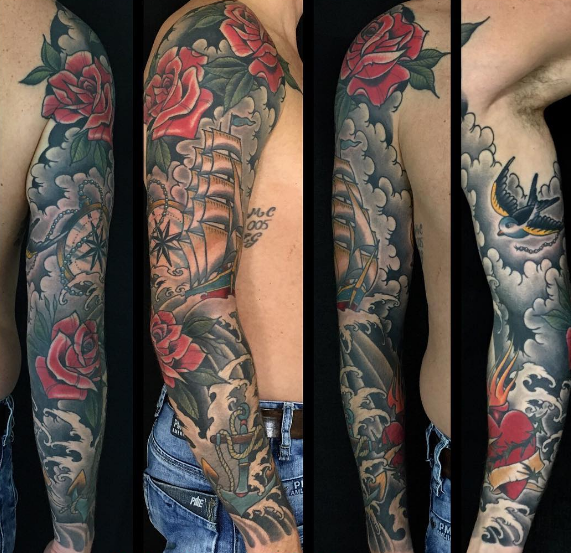 It claims to have one simple aim: “to make great quality tattoos that will last a lifetime.” I was drawn to both his and his co-worker Moira Ramone’s work because it is clearly executed with this ethos, as are any tattoos created with traditional techniques at their heart. 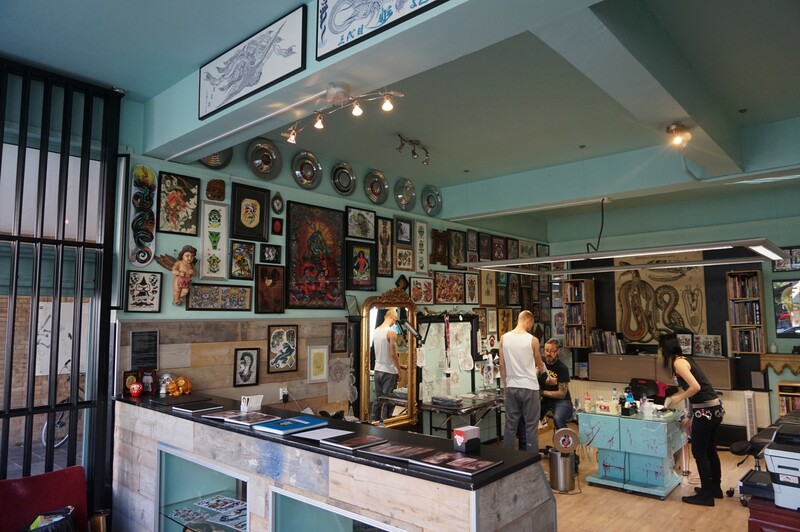 As for the name of the shop, “25 to life” is a slang term for a life-time prison sentence — a studio name that reflects Nico — and many other tattooer’s — commitment to this artform. Not to compare tattooing to a criminal sentence, but I’ve been encouraged to contemplate this at various times whilst talking to tattooers who have seen it all, and it’s always stuck with me. Something tells me that Nico won’t be granted, or better yet — accept, any kind of parole soon. Tattoos and photos by Nico Mensinga. Thank you for having me, Nico. 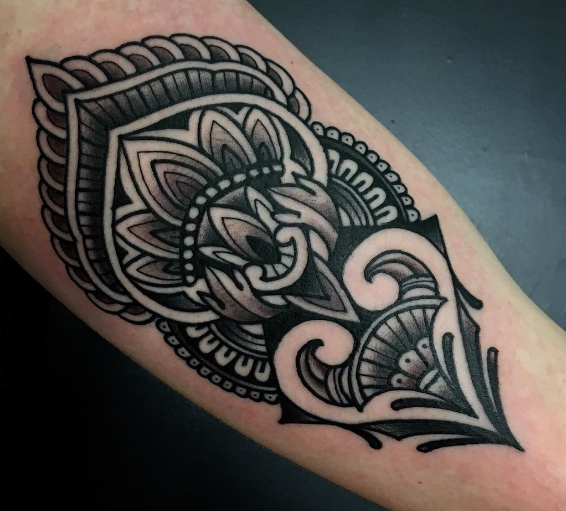 Where did your journey as a tattooist begin? How long have you been tattooing? I think it was 1996 when I started to tattoo out of my kitchen — yes, I was a kitchen-wizard back then. Luckily, pretty fast, I found out that this wasn’t the proper way to learn. I put all my stuff aside and started looking for a good artist, under whom I could do an apprenticeship. I finally started my apprenticeship in August 1998. Would you describe your work as ‘traditional’ in style? I like solid and readable tattoos that will pass the test of time. 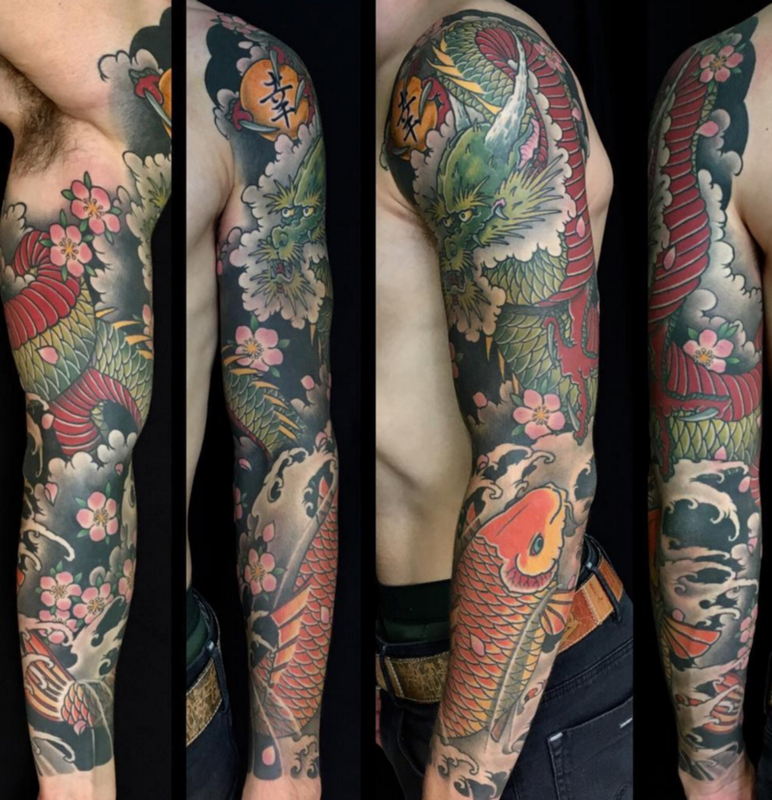 It doesn’t mean nothing that American Traditional and Traditional Japanese tattoos are long-lasting styles throughout tattooing history. A lot of ‘tattoo artists’ are afraid to use black in their work, and then it doesn’t look as solid. I do a lot of Western Japanese, which is more free than the Traditional Japanese. I also like to do American Traditional but with a little twist. I also like to do floral tattoos. In my apprenticeship I learnt to do as many styles as possible and that’s what I am still trying. Realism is not for me, however, but we have guests at the shop who do specialise in this. So, it’s yourself and Moira at the shop full-time? I am looking forward to getting tattooed by her later! Yes, my apprentice, Moira, she is doing super. She’s someone who is really into tattooing and its history — she understands what a good tattoo is. I am really happy and proud that she is my apprentice. How long has the shop been open now? After 7 years in the shop where I started my apprenticeship, I decided to open up my own studio. 25 To Life opened in August 2005. The first two years I worked on my own but had guest artists coming over — friends I’d met whilst travelling and working conventions. If you want to check out some of those guest artists: Lionel (Out of Step Tattoo), Chriss Dettmer, Nick Caruso, Kelu, Electric Pick, Kevin LeBlanc, to name a few. We have a nice variety of people working in the shop. I think we have a really relaxed atmosphere here — I am not a loud-mouth, show-off or wannabe rockstar! What is your connection to Rotterdam? My whole family comes from Rotterdam. I was born in Delft, but growing up we spent almost every weekend in Rotterdam, visiting family. When I was 24 I moved here (almost 24 years ago now). I always liked the way people are here — straight-forward and honest. I like that and think I am the same way. Is there a strong tattoo scene here? There are lots of scenes here in Rotterdam but to be honest, I don’t like to put things in boxes. Maybe that’s why I am not too involved in any scene anymore and rather look at them from a distance. The ‘scene’ — it’s changed a lot over the years. I just like to do my own thing with the people I like and trust. Last but by no means least, can I have some of your tips of things to see and do whilst I am here? I like to eat good food and that’s easy to do in Rotterdam — because of all the different nationalities here, you can have anything you can think of. A few favourites include: Deli Bird (Thai), Taberna Dushi (Caribbean Tapas), Itami (Japanese), Vivu (Vietnamese), Gamasot (Korean), just to name a few. Rotterdam has changed, of course, over the years — it’s more popular than ever. The nice architecture draws people, as well as the harbour (which is one of the biggest in the world). Hey, if you check it out you will decide for yourself!